Have you ever wondered where fish get their color, both individually and by breed? No one knows with 100 percent certainty how fish obtain their color nor why fish are so colorful, but there are a few theories. One animal that is similar to a fish in terms of the variety of color is a snake. It’s easy to see why snakes are so colorful; it’s a means of survival by blending into the grass, dirt, sand, and weeds. The need to blend into the environment is one obvious theory regarding the survival of fish as well. 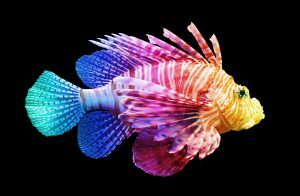 According to researchers, however, the reasons why fish are so colorful is probably much deeper than we know. In addition to using their color to hide from predators by camouflaging with the objects around them, there are several other theories and facts about why each fish has a variety of markings and each breed is different than the other. ● Identify each other underwater. ● Identify competitors within the same breed. Their vivid colors also tend to give them a fluorescent tone, which possibly allows allies to see them better. 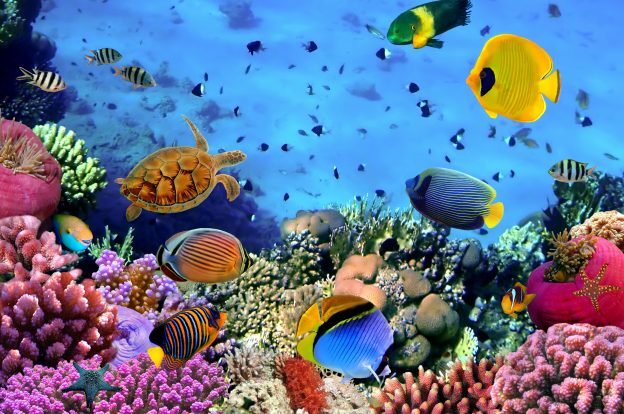 Because fish live in different areas of the water, be it near the surface or deep in the coral reefs, they need to adapt to their environment, which is an additional theory about why fish are so colorful. Another issue that factors into the equation is that humans can’t tell what fish see; truly, that would be almost impossible unless you were seeing through their eyes while they were still alive. The fish, therefore, might not even know how beautiful they are, but have their own methods of identifying each other that humans don’t quite understand. It’s also possible that the spotted, multi-colored fish that we see looks like one plain, solid colored animal to another fish from a distance. It could be nature’s way of allowing fish to be identified by friends but hidden from foes. When it comes to us as pet fish owners and aquarium enthusiasts, we simply reap the benefits that nature gives us. This is especially true for owners of reef aquariums, as fish that live deep in natural waters tend to have the most beautiful markings. If you are thinking of adding new livestock to your existing aquarium or are thinking of having a fish tank installed, contact us. We’ll help you identify the most ideal, beautiful livestock to suit your aquarium environment. This entry was posted in Fish Facts, Reef Aquariums and tagged Fish Facts, Reef Aquarium, Why Fish are Colorful on December 1, 2018 by admin.